A train traveling from Washington, D.C., hits a vehicle that was headed north on the train tracks in Mansfield. BOSTON – An Amtrak train hit a vehicle that was apparently driving on train tracks in Massachusetts, killing three people in the vehicle and derailing the train, authorities said Monday. The crash also disrupted and delayed train service along the busy Northeast corridor. The train was derailed by the impact of the crash just before midnight in a remote area about 25 miles southwest of Boston, authorities said at a news conference near the crash site in Mansfield. None of the 180 passengers or crew aboard the train, which was heading to Boston from Washington, was injured. Amtrak had to temporarily cancel some service to and from Boston, but it was restored Monday morning, a spokesman said, adding that residual delays were expected in the Boston-New York corridor because trains would be operating on a single track. Commuter trains in Massachusetts also reported delays. The vehicle, possibly an SUV or a truck, was headed north toward Boston, MBTA Transit Police Deputy Chief Kenneth Sprague said. There were multiple places in the area where the vehicle could have driven onto the tracks, Mansfield Police Chief Ronald Sellon said, and it was not immediately clear which access point the vehicle had used or how long it had been on the tracks. It was also unclear how fast the Amtrak train was going at the time, Sprague said. He said the train speed limit in the crash area is 125 mph. He also suggested the train operator may have tried to apply the brakes before impact, which could have contributed to its derailment. Sprague said investigators were working to identify the victims, two men and one woman. Sprague said the recovery operation faced a number of challenges because the crash site spans nearly a mile in remote woods. That was partly why investigators had initially only reported two deaths in the crash. “It’s a very big area down there,” he said. The train was put back on the tracks, and investigators were expected to be at the site most of the day probing the crash. The train accident was one of two being investigated Monday in New England. 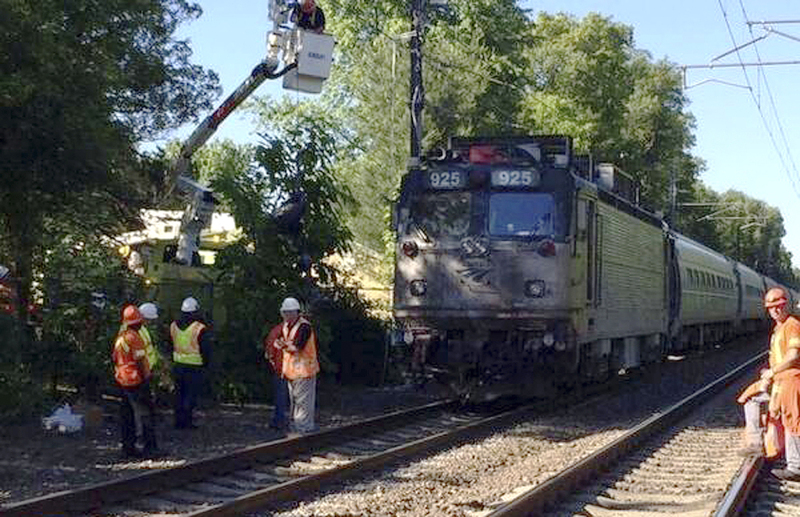 Another train, with about 45 passengers aboard, struck what appeared to be a wood chipper being towed by a truck in Berlin in central Connecticut on Monday morning, injuring five people, Amtrak spokesman Craig Schulz said. Local police said the injuries were minor. Schulz said the train left New Haven at 8:40 a.m. headed to Springfield, Massachusetts. The uninjured passengers were being bused to Springfield, and Amtrak service in central Connecticut was suspended.